Just across the street from the Ybor City Food Mart is a former grocery store now occupied by a restaurant. Demmi's Market, as it was called, has been restored on the outside for the Market on 7th bar and restaurant. The market, which dates to 1946, is much like urban supermarkets in the New Jersey area, being narrow but very deep. Notice the tile designs on the facade, similar to the Food Mart's. The Market on 7th is a few doors down from the famous Carmine's restaurant of Ybor City, where I ordered a Cuban sandwich. It was mediocre at best -- I can safely say that the Cuban sandwich at Tropical would have been much better (which I did not have but saw at the store). And I can definitely say for a fact that the Cuban sandwich at El Salvadoreño in Elizabeth, NJ is superior to that of Carmine's as well. 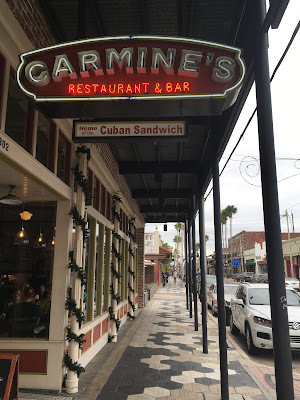 If you're going to claim to be the "home of the Cuban Sandwich", then you can at least do a better job on it than a hole-in-the-wall supermarket. Or, as I firmly believe, just go to the hole-in-the-wall supermarket. Anyway, Demmi's is visible just past the awning here.